← French Children Don’t Talk Back! We are an English family living in France. Our children are being brought up to be bi-lingual. They speak French exclusively at school and speak English exclusively at home. Is it difficult? Not really! It’s amazing how adaptable children are and how quickly they learn to cope with switching from one language to the other. We’ve never made a big deal about it and neither have they. 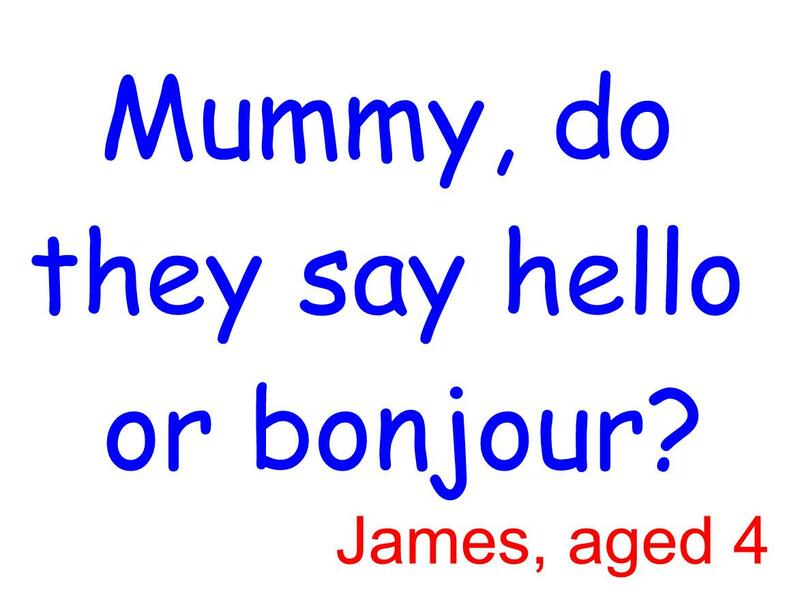 James found his own way of asking whether he should be speaking French or English when he used to ask “Mummy, do they say hello or bonjour?”. When we first moved to France with our children in 2004, we did consider whether it might be better to try to speak French at home to help the children adapt at school, but to be honest, our French really wasn’t good enough and I think it would have been more of a hindrance than a help. How long did it take to be fluent? We’re often asked how long it took for our children to be fluent. It’s been slightly different for each of them. Ryan was ten when we moved here and spoke hardly any French. He says the first three months he hadn’t got a clue what was being said to him at school, but then over the next nine months his French got stronger and stronger. By the end of the first year his French was competent enough to move onto the College and within eighteen months he was largely fluent. What did we do to help this transition? Nothing. We just let it happen in it’s own time. We didn’t feel the need to get extra help for him, we didn’t expect too much of him, we just let it happen in it’s own time and it did. James was two when we arrived in France and started at the Maternelle at three years old with no French at all. He said nothing in class for about the first twelve months. We weren’t sure if he was really learning or not, although the teachers said he understood what was being said to him. Between twelve-eighteen months after starting school he started speaking French and he started speaking full sentences. It was as though he didn’t want to speak until he could be sure he would get it right. Now he’s ten and in the last year of Primary school. He’s top of the class in most things and has very little problems with his French (no more than any other French child with the complicated French grammar). Luc was born here and started school at two and a half He didn’t have much French, but had at least been exposed to it during the first few years of his life. He was more confident at school than James had been and was more willing to speak in French, but it was still at least eighteen months before he was speaking fluently. Frankie our youngest was born here too, however, at eighteen months she started going to a French nounou (child minder), two days a week. I was working and although she could have gone to my parents, I decided it might be more helpful to her to learn some French before starting school. The nounou didn’t speak any English and it was probably about three months again before she started to understand what was being said to her. Within six months the nounou told me she was starting to speak French (although she wouldn’t at home) and by the end of the year she had a good understanding of French and could speak simple sentences. She started school at three and has had no problems at all. She understands everything and although she’s quite shy at speaking in class, she speaks well with the other children in the playground. She’s now five and speaks French when she’s playing with her dolls, but rarely speaks French to us. I noticed over the summer holidays that she started to speak English with her dolls, but within a week of returning to school, she reverted to French with them again. Which Language do they prefer? None of the little ones like us speaking to them in French, I think although they can speak French fluently now, English is still their first language, so when at home they prefer to speak English as it’s no effort for them. I bought lots of French children’s books to read to them to help the little ones, but they won’t let me read them in French. I have to translate them into English! However, I find that Frankie is more receptive to being read to in French. Maybe because she was introduced to it earlier? Given the option of whether to watch a DVD in French or English, they will always opt for English. However if there’s not an option, they’ll watch it French. We used to have French TV in the kitchen and UK Satellite TV in the sitting room but nobody bothered to watch the French TV except me (it really isn’t that good). Now they’ve gone digital in France, we no longer have French TV. I sometimes worry that they are missing out on some of the French culture and exposure to extra vocabulary they’d get from watching French TV. However Ryan (now eighteen and at University in Montpellier) says he doesn’t really feel it’s a big deal. The French Youth Culture is not so centred on TV anyway and he’s never felt he’s missing out on anything. Also, I think it’s important for our children to identify with their British roots and this is reinforced with UK satellite TV. Helping them with homework can be difficult. For instance, they have to learn to recite a new poem every week (a useless exercise if you ask me, but that’s another story). I try reading out the poem first and more often than not my children get cross with me because I’m not pronouncing it correctly! We now find that James the ten-year old often helps Luc (seven) and James can manage on his own largely. Occasionally the grammar exercises for James are really hard and I have to trawl through the internet trying to find help with the answers. Ryan has just had to get on with his homework himself as we could never really help him much. He seems to have managed well, and it’s made him more independent. They may be Fluent but do they still sound English? Our children all speak English with an English accent, however I know of an English family where the children speak with a French accent, but they have French TV only and speak a lot of French at home, so maybe that’s why. We are told that our three youngest children speak French with a local accent and it’s not possible to tell they are English. Ryan apparently has a slight accent, but people often think he’s from Marseilles or another part of France. When he was helping another student with his English homework recently, some of the other students asked why he was helping him. They hadn’t realised he was English. If I could give any advice at all to anyone in a similar situation I would say be patient, don’t fuss and let it happen naturally. The more you fuss and worry, the more pressure you put on the child and the more likely you are to have problems. Maybe we’ve just been lucky, but our policy has always been to interfere as little as possible and it seems to have worked out fine so far. If you give it time and trust nature to take it’s course you will be greatly rewarded. It’s so lovely to hear your child talking away in a second language so naturally. What a wonderful gift to be able to speak two languages effortlessly and fluently – it’s one of the many benefits of growing up in a foreign speaking country. I totally agree with you. DD, who was born in Israel, started at a Hebrew speaking nursery at 19 months without any Hebrew. She is now halfway through her third year in a Hebrew speaking environment and she is 4. The first two years at the private nursery she got a basis of Hebrew but her speaking was slow as there were a group of English speakers who used to play together in English. In her new kindergarten there are only three other English speakers and her Hebrew has improved tremendously even in five months. Thanks MS, yes English speakers in the class can hold them back a bit as they tend to speak English with them as it’s easier. All of my children had no other English in the class when they started school in France – which probably helped them because they had to try harder to communicate. This is a fascinating and very well-written article. Unfortunately I have no experience in bilingualness (?!) but something I’ve always wondered about immersing children into the system in this way – how do they cope emotionally? Especially the older ones. Thanks Carole, sorry to hear how your daughter was treated at an International School. I guess I’ve been lucky as all my children seem to have coped well emotionally too. Ryan was ten when we moved here and was the only English student in a very small village school (17 pupils). Luckily his teacher was really sympathetic and helped enormously and the other students were very friendly to him. However our eldest was 14 when we moved and he stayed in education in the UK (coming home just for holidays) as we felt it was too difficult an age to move him. He’s now at Uni in the UK and did an exchange year in Montpellier last year (his 3rd year). He’s now fluent in French too, though his English accent is stronger than his younger siblings who have all been schooled here. This is great and such a hot topic amongst friends at the moment. BiP is almost 3 and speaks both French and English (English only at home). She gets really upset if I speak French to her which means I have to translate her French books into English. Pretty funny seeing her get all angry and wagging her finger at me “No Mummy! Pas speak French, you speak ENG-LISHHHHHH” – Bilingual kids are seriously fascinating! Great article, will share! Thanks Ameena. I agree, Bilingual kids are really fascinating. My youngest often speaks an mixture of English and French, especially when it’s something she’s familiar with in French (at school), but not heard the English before.